80/159 David Mumpower Colorful, heartwarming family fare works well. Note: the British version available on DVD is vastly superior to the American, Jimmy Fallon one. This animated film is based on a cult children's television show that was popular in Britain during the 1960s. The voice actors include a variety of some of the most popular performers in the UK, such as Jim Broadbent, Joanna Lumley, Bill Nighy, Ian McKellen and Robbie Williams. As the story begins, an evil being called Zeebad has risen up with the insidious plan of taking over the Enchanted Village as his own icy kingdom. 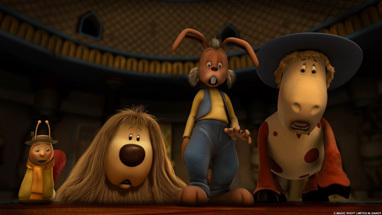 A group of unlikely heroes - Brian the snail, a cow named Ermintrude, Dylan the rabbit, and a dog named Doogal - will have the responsibility of finding three magical stones that are scattered throughout the land. If they can restore them to a thing called the Magic Roundabout, flowers and grass will be able to grow again and their oppressor's plot will be thwarted. See the latest developments for this project on the Doogal Movie News page.